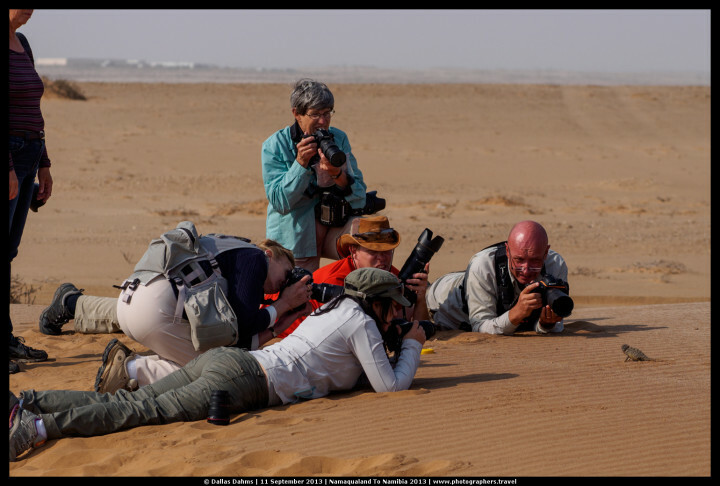 For the past 6 years, together with my tourism business associate, I have been arranging photographic safaris here in Africa for people who come from all over the world to get a taste of the wildlife and awesome landscapes that can be found in Southern Africa. We’ve been all over South Africa (where I live), Namibia, Swaziland, Botswana and last year we also saw a little bit of Zambia and Zimbabwe at the Victoria Falls. It’s been a very interesting and diverse photographic journey since we started offering these safaris in 2009 but there is one safari I look forward to repeating every year, namely our Ultimate Big 5 Safari. 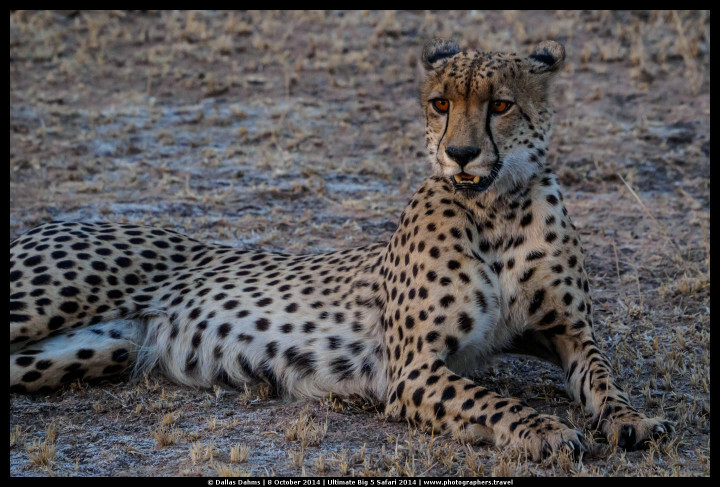 Basically what we do is book out a small camp in the Sabi Sands, which is a private game reserve that is joined to the greater Kruger National Park. As there are no fences between the two parks the animals are free to roam between them, but what makes the Sabi Sands special is that only the private lodges situated there may drive vehicles around on this land. This means that there are no congested sightings and also, if it hasn’t been raining the rangers are allowed to follow certain types of animals off-road, such as lions and leopards. This can make for some very close and exciting animal encounters! 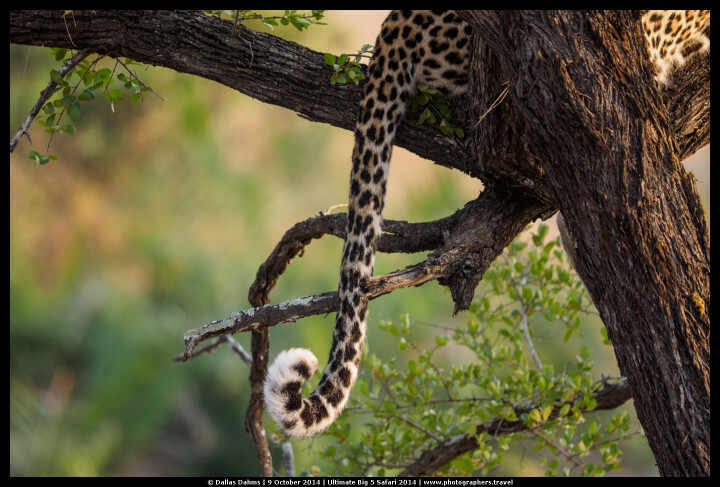 The Sabi Sands region is known to be the best place on earth to view leopards in the wild and we have never been disappointed in this regard. 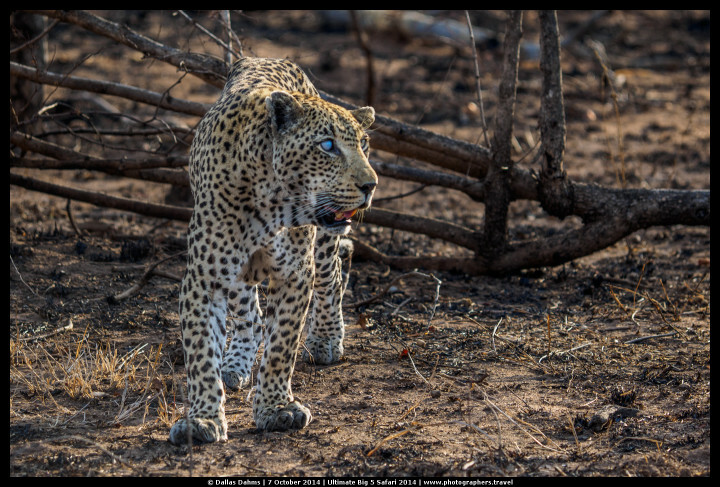 Quite often we see more leopards than we see lions and last year was no exception. We actually didn’t see any lions on that trip at all, but we did see an abundance of leopards (at least 5 different ones), including two successful leopard hunts where two different cats took out scrub hares on two separate game drives we were on. 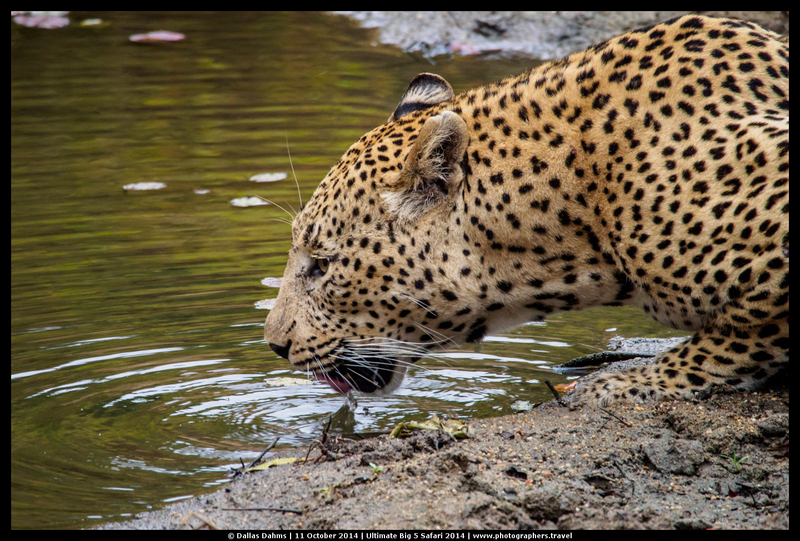 Those were quite amazing sightings, especially when the first leopard, a juvenile, began playing with its lunch by tossing it in the air and pouncing on it repeatedly right in front of us! On another morning we had a sighting that was a once in a lifetime thing. 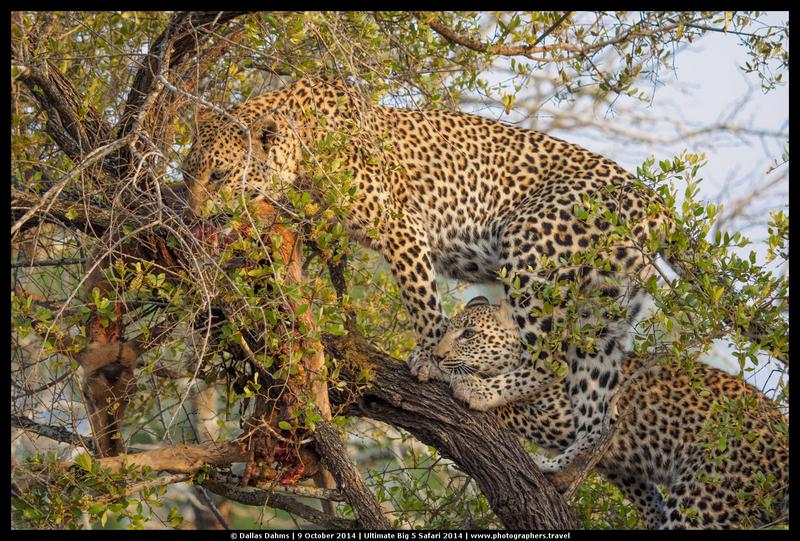 We came across a leopard mother and her 1 year old cub in a tree, happily feasting on an impala that the mother had caught earlier. 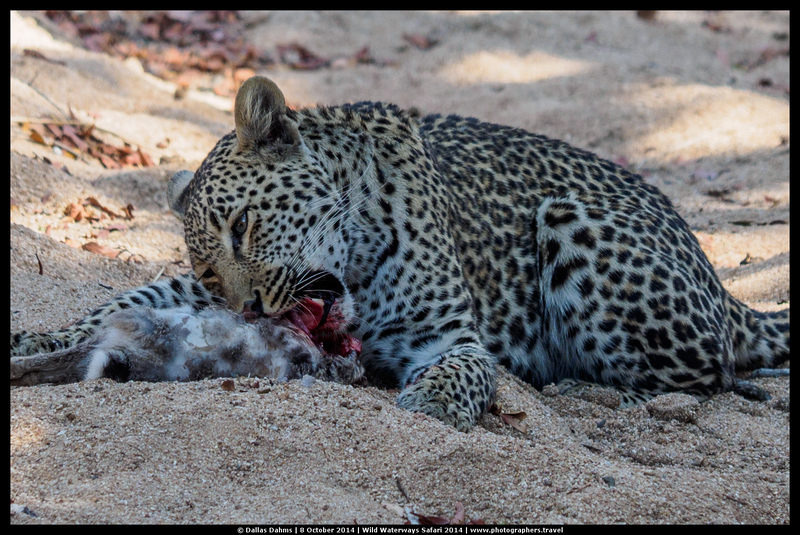 Leopards will usually drag their kills into trees so that they don’t lose them to other predators, but on this occasion the cub’s exuberant munching caused the impala to slip out of its reach. As it dangled precariously from the tree the cub frantically tried to get its mother to help it rescue their food. Unfortunately the kill slipped out of the mother’s grasp just as she was trying to hoist it back into the tree. 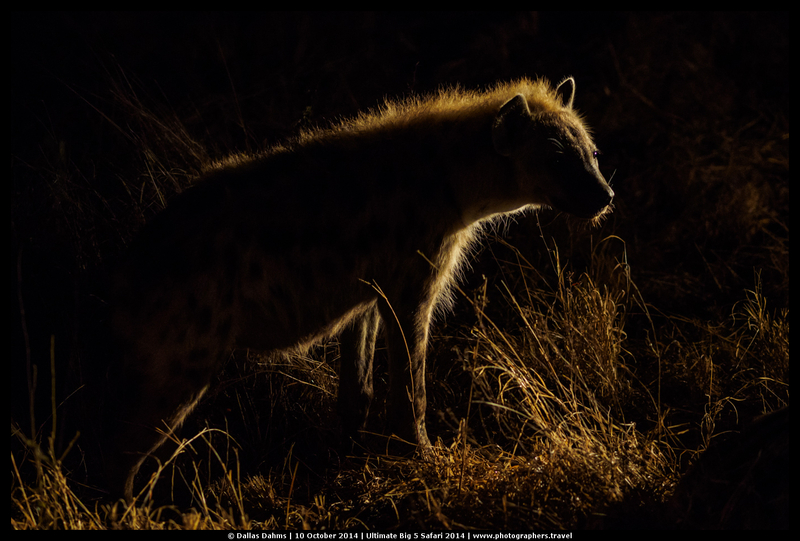 As it hit the ground below a patiently waiting hyena picked it up and scampered away with it. Incredibly I captured this entire scene on video using my Olympus OM-D E-M1 with an M.Zuiko 50-200mm f/2.8-3.5 lens. I was extremely happy about making the decision to turn to video instead of stills on this occasion. 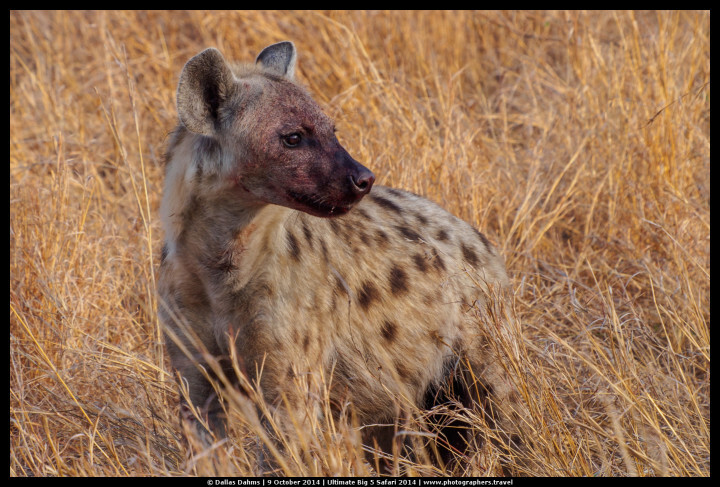 Of course I had no idea that the kill was going to be caught by a hyena – that was just pure luck! The E-M1 did really well with the video and the IBIS was a big help for me while hand holding the camera and a not-so-light lens for upwards of 20 minutes. The following video is a much shorter 5 minute edit of this encounter. 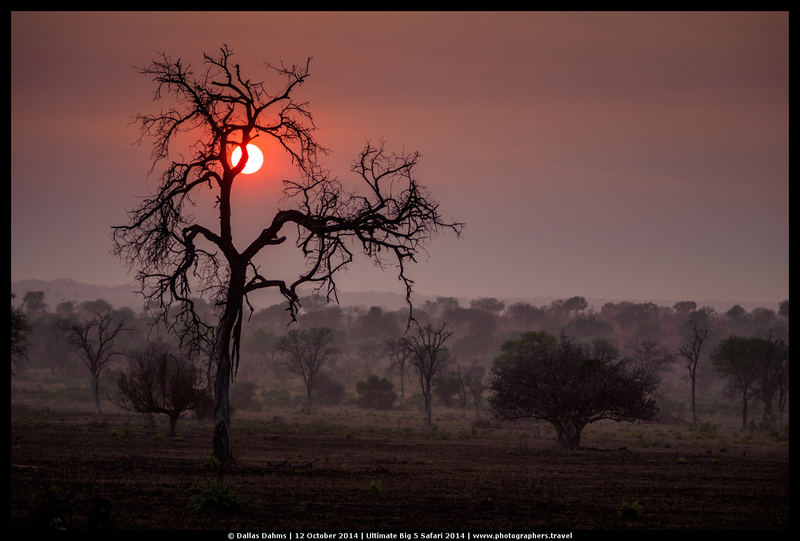 So why did I go mirrorless for safaris when everyone else is still extolling the virtues of monster DSLRs? 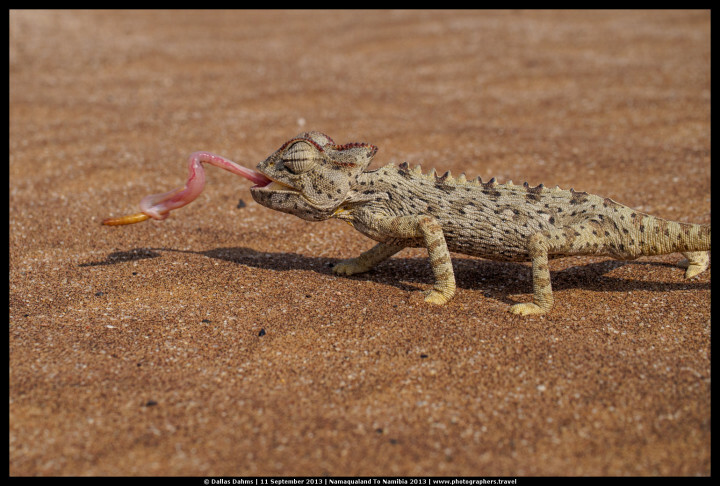 During a road trip safari to Namibia in 2003 I made a somewhat interesting discovery about my photographic behaviour on that trip. I found myself using my Olympus OM-D E-M5 much more than I was using my beloved Nikon D700. In nearly every shooting situation we found ourselves in, the OM-D was with me and it was delivering results that I was just totally in love with. From landscapes to candids and wildlife images. I found that it was making the process of taking photos on a road trip just so much easier. I had about 6 lenses for the system at the time and they all fit into a ThinkTank Retrospective 5 shoulder bag which was delightfully easy to carry around with me wherever I went. Included in the bag was the OM-D E-M5, Panasonic 14-45mm f/3.5-5.6, Panasonic 45-175mm f/3.5-5.6, Panasonic-Leica 45mm f/2.8 Macro Elmarit, Olympus 9-18mm f/4-5.6, the amazing Olympus 75mm f/1.8 and a Samyang 7.5mm f/3.5 fisheye. I fell head over heels in love with this system on that trip. Everything just worked the way I needed it to and I had the little bag with me at all times, barely feeling it on my shoulder. My Nikon stuff was in the boot of the Land Rover in a ThinkTank Airport Security roller that only came out of the car when we were checking into our various lodges and hotels. Having the mirrorless system was like a revelation to me. The bag fit perfectly between the armrests of the front seats and I had everything from fisheye to moderate telephoto easily within reach. 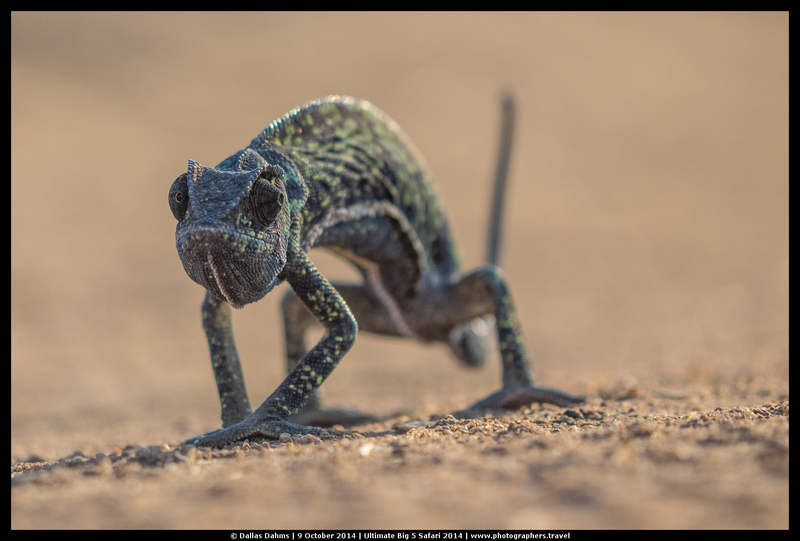 Another advantage of the system became apparent not only in terms of having the gear close to me all the time, but also one day in the desert at Swakopmund we found ourselves shooting chameleons as we fed them some grubs our guide had provided us with. As you can imagine, the only way for a DSLR user to shoot something on the ground is to get down on the ground with it. I wasn’t all that keen on lying in the sand, so I tilted my E-M5’s LCD up, hunkered down and touched the screen to unleash 9 frames a second shooting. 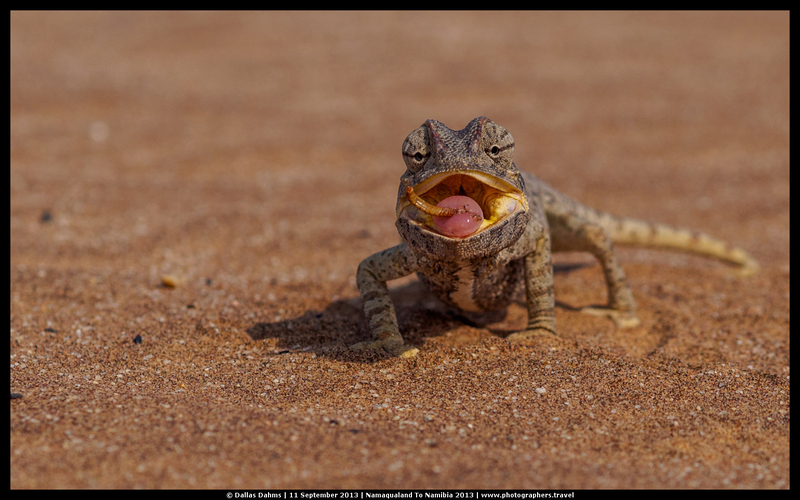 I got the chameleon in frame perfectly and also caught it’s incredibly fast tongue darting out to zap the grubs. A short while later I took this shot of my guests using their DSLRs while lying on the ground to get the same images. That moment was when I knew that the DSLR had died for me. I didn’t want to work around its physical limitations anymore. 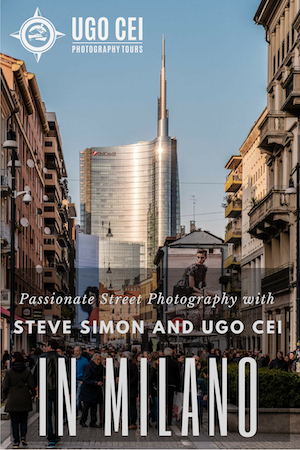 I wanted a camera that enabled my photography to be a little easier and the E-M5 delivered that in heaps with its tilting touch screen and other advanced features. Ironically I think it was that very night while I was relaxing in my room at the hotel when I read that Olympus had just announced the E-M1. It closed up all the doubts for me about the Micro Four Thirds system, particularly where it came to autofocus tracking, a significant weakness of the E-M5. 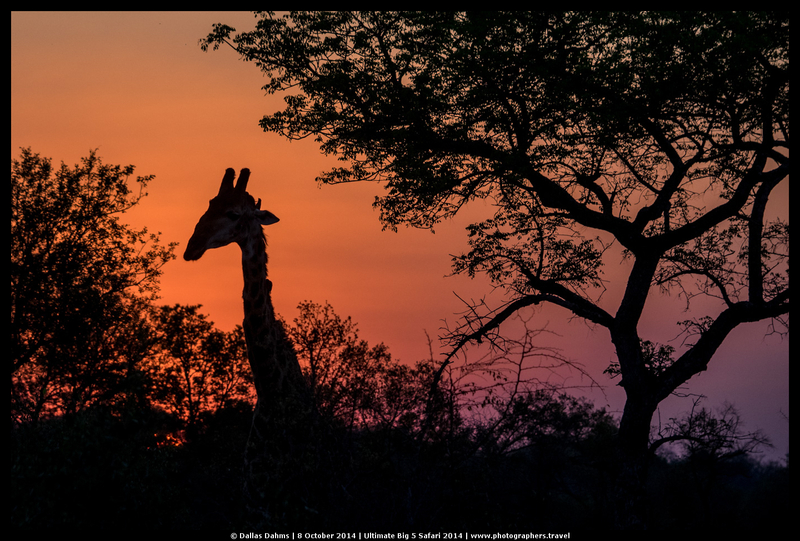 I couldn’t wait to get one and begin planning my future safaris to be completely mirrorless (for me that is, my guests still require some coaxing although I have convinced more than a couple of them to look seriously at the OM-D system). Last year that all came true. I found myself taking with me to Botswana a slightly larger ThinkTank Retrospective bag (the 50) but inside it was the E-M5 and E-M1 (both with grips), an Olympus 75-300mm, a 50-200mm f/2.8-3.5 and an assortment of other smaller lenses. Oh yes, and my 13” MacBook Pro. I still didn’t feel it on my shoulder that much, although to be honest the main weight was coming from the MacBook. The first of our safaris for 2014 was water based. 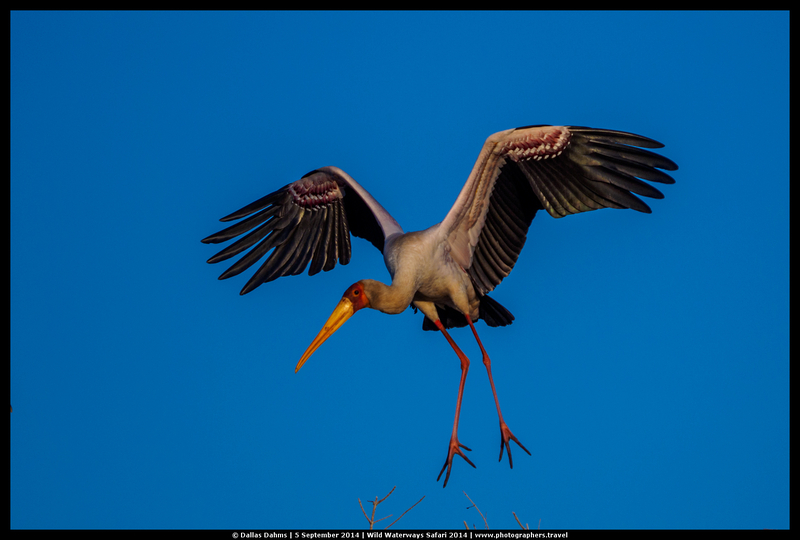 We spent some time on a houseboat on the Chobe and Zambezi rivers and also on a specialised photographic boat, with swivel seats and gimbals for large lenses. The folks using big lenses were very happy with that, but I did most of my shooting handheld. The E-M1 and 50-200mm combo was great for most stuff while for things further away I was using the E-M5 and 75-300mm. Our Wild Waterways Safari is more about the birds and the elephants, so after I succeeded in getting the kinds of photos I had hoped for with the OM-D system in Botswana and Namibia, I was looking forward to seeing how things would pan out on the Ultimate Big 5 Safari which happened a month later. We always spend a whole week in the Sabi Sands and the reason we do this is because the bush is like an ongoing game of blackjack. Some days you’re winning big, other days you’re SOL. Last year’s trip was no exception. We had a couple of days where we didn’t see anything at all, but on the days where we did see things they were the best sightings we’ve ever had. Staying in one place over a longer period of time gives us a much better chance of experiencing those kinds of sightings and it’s why I love going back there every year. As Forrest Gump would say, “You never know what you’re gonna get.” We’ve seen cheetah chases, lions hunting and feasting, leopards walking through our camp, hyena shenanigans, you name it. A lot of the time if you go on a private safari to these types of safari lodges you will have to go on game drives with non-photographers, which can become more of a “Safari Ferrari” experience where you’re rushing from one sighting to the next without spending the time you need to observe and capture the animal behaviour. It’s seldom likely that a non-photographer will want to sit and watch the same animal for more than a few minutes. 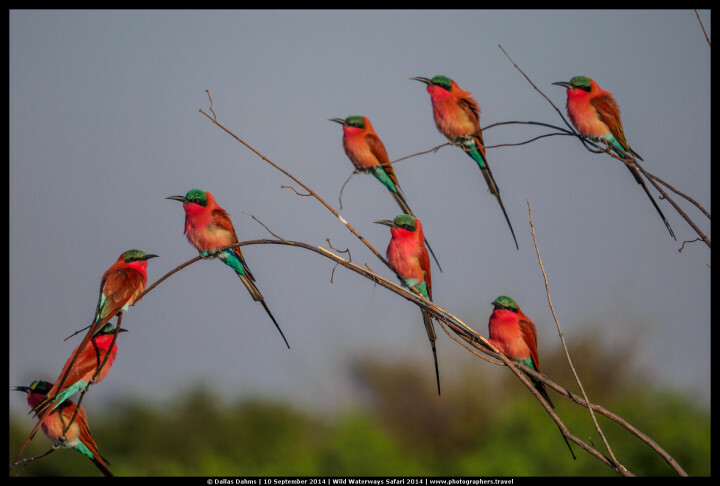 Being with a dedicated photographic group means you get to dictate the daily routine as well as the objective of any game drive. 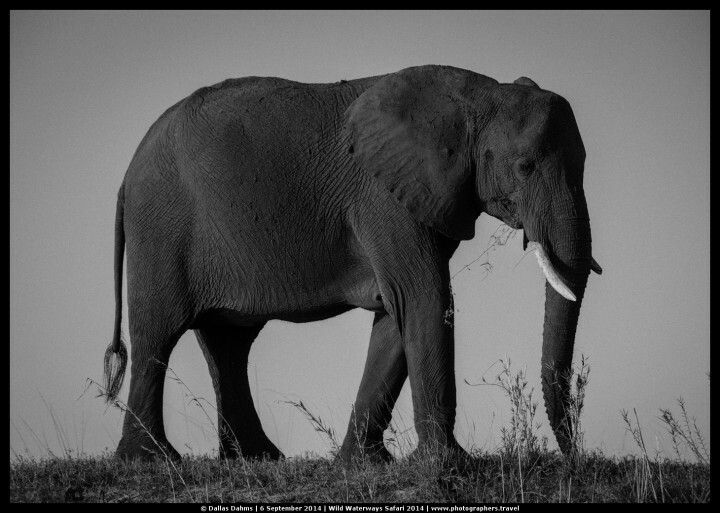 If we want to spend an entire day shooting elephants we can, or if we want to go out after dinner to photograph the stars on clear nights it’s not a problem either. We have time on our side and that’s the most important consideration for a successful wildlife safari. 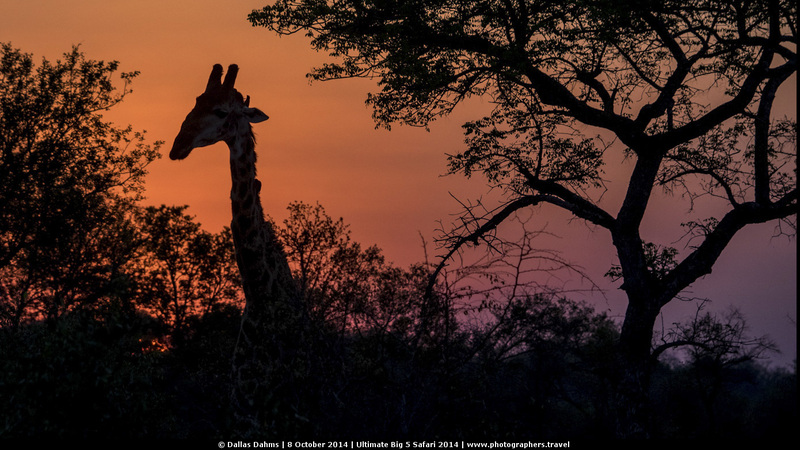 The 2014 Ultimate Big 5 Safari turned out to be the best one we’ve ever had. Even though it was missing the all important lions (who had sequestered themselves on a neighbouring reserve to raise some new cubs) we had everything else, including the rarest of sightings on our very last drive. While we were out early in the morning looking for more leopard tracks, we got a radio call from one of the other rangers in the east telling us that a pack of African Painted Wild Dogs had just entered the reserve and were moving fast in search of food. 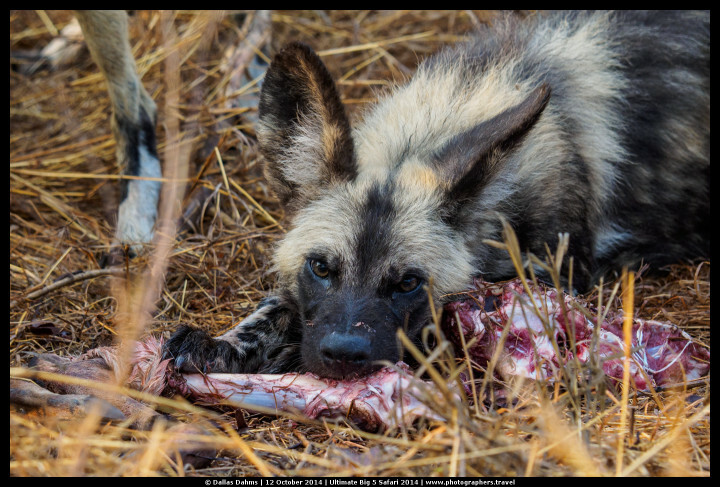 Although not part of the Big 5, the wild dog is one of the most endangered species of wild animal left in Africa. 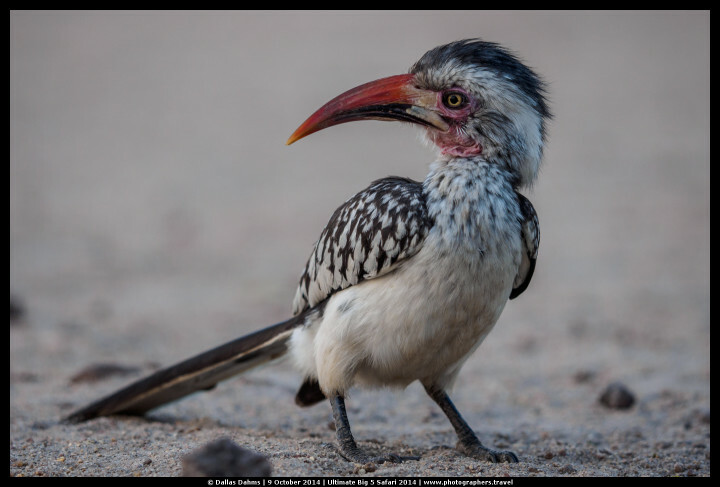 It’s said that there are less than 350 of them in the Kruger park alone, so to see them is not only rare in itself, but to see them hunting is even rarer! What followed next can best be described as a “mad dash” as our two Land Rovers filled with excited photographers raced from West to East in search of these elusive predators. After about 20 minutes of almost falling out of the vehicle we met up with them and they were amazing to see! They move so quickly that keeping up was a challenge for our rangers, but they did an awesome job through rather unfriendly terrain. 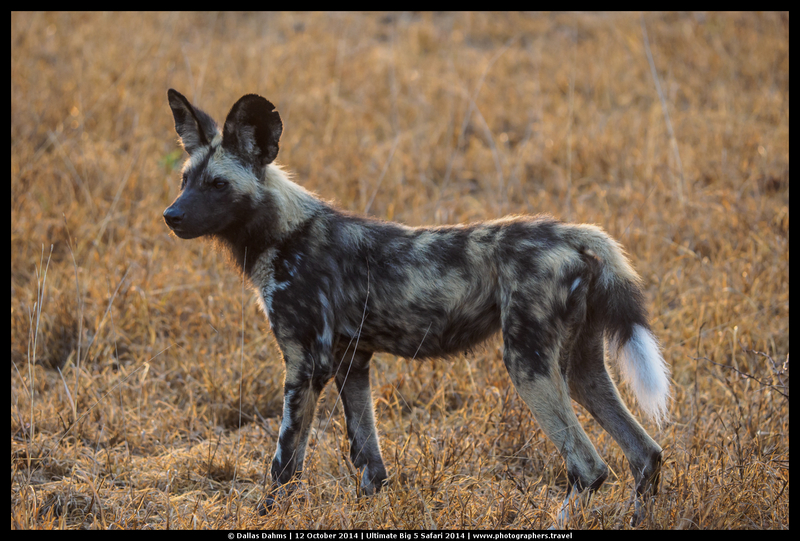 We got some great shots of the pups and then on a second radio call we heard that the adults had just taken down an impala a short distance from where we were. I don’t think that even 5 minutes had passed between the time we got the radio call and when we got to them, but by then the poor impala they had caught had been reduced to mere bones. They were savage in the way they devoured that hapless animal. And so with that exciting encounter my first year of being 100% mirrorless on safari came to an end. 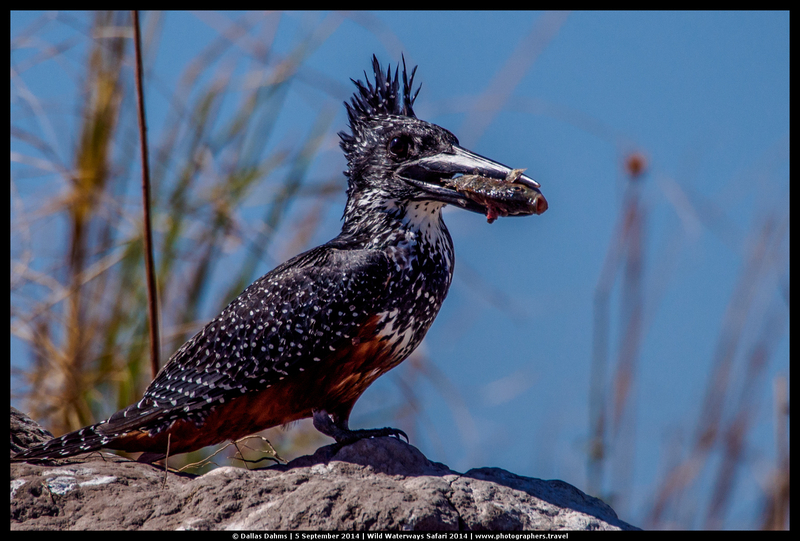 I was absolutely happy with the images (and video) I got using both the E-M1 and E-M5 and a variety of lenses, including the 4/3rds 50-200mm with an MMF-2 adapter on the E-M1. I didn’t feel in any way hampered by the gear’s performance on the auto-focus side of things and everything was easily manageable size-wise. I didn’t even run out of power on either camera during the day. In fact I don’t think the second battery in the grips was used at all, in spite of the amount of video I shot. I should mention at this point that one of the biggest advantages I enjoyed by doing the 2014 safaris with only mirrorless cameras was that the short flights I had to make were a breeze. I didn’t have any stress about hand luggage at all, whereas on my previous safaris it required a lot of planning and contingency planning around the gear. A lot of the time I was a complete ball of nerves trying to get around 20kg of gear onboard as carry-on. Now that the Airports Company of South Africa are more strictly enforcing the hand luggage weight and size limits (1 pc only for economy class, not exceeding 8kgs) travelling here with big lenses like those used on DLSR systems is going to require that they be checked in on domestic flights, so if you’re going on safari with that kind of gear you’ll have to invest in something like a Pelican hard case because you’re going to have to check it in with your other luggage and pay a bit extra too. Fortunately because we are based in South Africa we try these days to avoid flying domestically by using road transfers wherever possible. 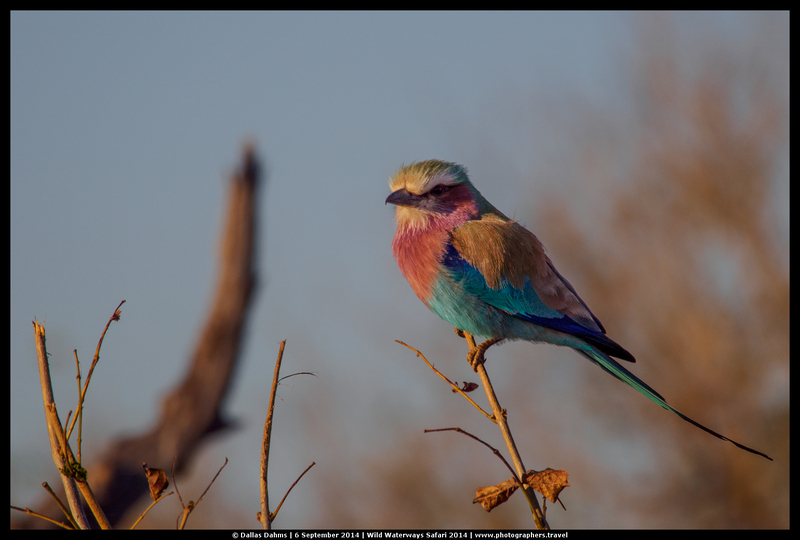 On the Ultimate Big 5 Safari last year we did this and it worked fine. It’s a bit longer to get there (about 6 hours by road from Johannesburg), but its a lot less stress with the gear. If any Mirrorlessons readers are interested in joining us on either of these safaris this year please go check out our website www.photographers.travel. We have limited spaces available on both these adventures this year.